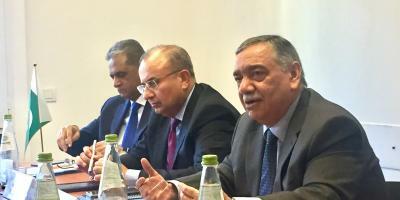 IDLO welcomed senior members of Pakistan’s judiciary for a wide-ranging discussion on legal reform and challenges facing Pakistan’s judicial system. The roundtable meeting formed part of a growing partnership between IDLO and The Asia Foundation aimed at exploring avenues to support the Supreme Court’s commitment to develop a National Judicial Reform Roadmap for Pakistan. The country’s legal framework constitutes a complex combination of common law inherited from colonial British India, customary law, military law and Islamic law. Despite being the world’s sixth-largest country with a population of 200 million, Pakistan has only around 4,000 judges, resulting in a much higher ratio of citizens per judge compared to other nations. Backlogs in the courts have progressively diminished the confidence of the public in the formal justice system. 1,8 million cases are reported as pending, and it can take 10-15 years for cases to reach the Supreme Court. “Even if judges worked twice as many hours, they still wouldn't be able to handle the backlog and influx of new cases,” said Justice Asif Saeed Khan Khosa, a senior judge of the Supreme Court of Pakistan who has been designated to become the Court’s Chief Justice as of January 2019. “In the United States and the United Kingdom, the Supreme Court rules on about 80-90 cases per year. In Pakistan, we have to process the same number of cases in one day.” The problem is exacerbated by a lack of funding for the judiciary and an ineffective use of technology, he explained. Justice Khosa was accompanied by Supreme Court Justice Syed Mansoor Ali Shah and a senior judge of the Lahore High Court, Justice Muhammad Anwaarul Haq. The discussion was held together with Rome-based rule of law and development experts at IDLO’s headquarters on September 17, 2018. Pakistan has been a Member Party of IDLO since 2016.